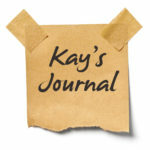 Kay’s Journal: Lightning Strikes | Welcome to the new Journalverse! Settle in for a story about an experience about two electrifying experiences in 1991, and the lessons I am only now beginning to ground into conscious action. What an amazing story. Perfect for Mars in Retrograde as your soul and your instinct/intuition converge. Thank you, Harriet! Not sure where this is headed, but … I’m on the train.